As part of the post-construction monitoring of a new wind farm in Northamptonshire, Wild Frontier Ecology was commissioned to undertake invertebrate surveys. The aims of the invertebrate monitoring were to help inform an assessment of the condition of the grassland field margins which are managed as part of the Habitat Improvement Plan for the site. The work schedule for monitoring prescribed terrestrial invertebrate sampling in years 1, 3, 6 and 9 following the construction of the wind farm, with surveys taking place in the second and third quarters of each year. 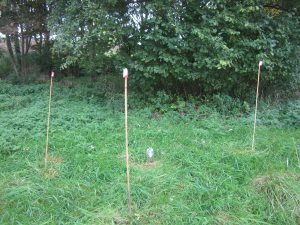 The survey strategy we developed involves the use of a combination of simple pitfall traps, swish netting and “CWAC” traps (devised by the University of Reading’s Centre for Wildlife Assessment and Conservation). 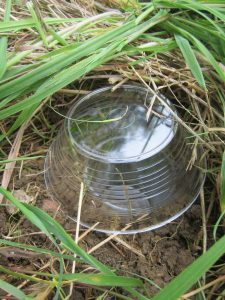 This mix of trapping methods allows us to target a range of insects using the grassland habitat from ground dwellers such as some Coleoptera (beetles), Mollusca (slugs and snails) and Isopoda (woodlice etc), to more mobile climbing and hopping species such as Hemiptera (true bugs) and Hymenoptera (ants) as well as low-flying species including examples of Diptera (flies) and Lepidoptera (butterflies and moths). We weren’t expecting there to be any rare species on the site, as it is intensively farmed; it was more important to get an idea of species composition and abundance suitable for comparison over time. 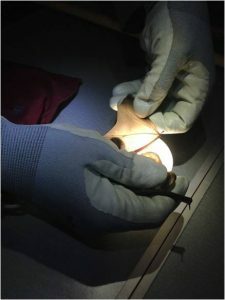 Therefore the most efficient way of analysing the samples collected was considered to be by DNA analysis using metabarcoding techniques, undertaken by NatureMetrics, a company specialising in genetic analysis for the monitoring of biodiversity. 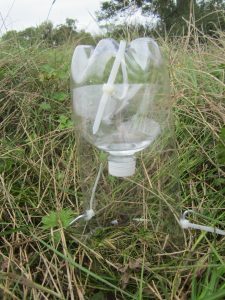 CWAC traps are made from plastic two litre bottles. The top end is cut off approximately one third of the way down and inserted into the upside-down body of the bottle, with small windows cut out of the sides. A window is cut out at the bottom of the trap to allow entry to low-flying insects. They tend to fly into the top of the bottle and become trapped, falling into a reservoir of preservative fluid. 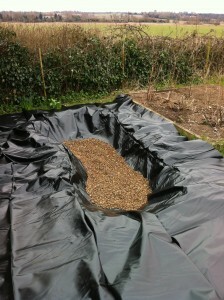 The trap is secured in place by two tent pegs and re-usable zip-ties. The pitfall traps are simple yet effective. Small pits were dug into the ground (which at this particular wind farm was no mean feat when the heavy clay soil had become sun-baked) and plastic cups inserted, with the rim of the cup flush with the surface of the soil. A small amount of preservative fluid is poured into the cup (filling it to about a third) and a plastic lid is placed loosely over this in order to prevent the cup filling up with rain. 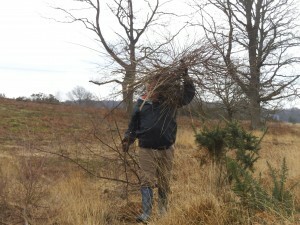 Five survey locations were identified in order to cover variations in the grassland habitat. At each survey point a single CWAC trap was deployed, with three pitfall traps placed one metre from this in a triangle formation. The pitfall traps were marked with canes for ease of re-finding upon collection. The killing/preservative fluid used in the traps during the first trap deployment in June was a soapy solution, which although an effective killing fluid turned out not to be a particularly successful preservative. Although there was some concern that the quality of the DNA would be compromised because of this, the laboratory analysis by NatureMetrics turned out good quality and informative data. In the second sampling effort of the year (September) we switched to using an ethanol solution, which was a vast improvement, giving a better quality sample that was much gentler on the olfactory system! The analysis by NatureMetrics used their “invertebrate identification from bulk sample” pipeline. This involves grinding up the entire contents of each trap sample, extracting the DNA from the resulting ‘invertebrate soup’ and then sequencing it. Each sample produces many thousands of DNA sequences, which are compared against an online reference library to assign taxonomy. The majority of taxa (over 80%) could be identified to species, and the remainder were assigned at the genus or family level. Overall NatureMetrics identified 144 unique taxa within our samples, 123 of which they were able to identify to species level. The results produced were well presented and easy to interpret. They will be straightforward to compare with the results of subsequent years of sampling. The summary of results presented at the start of the NatureMetrics report gives a concise synopsis of key findings. The graph in this section (examples below) is a great way to visually express the composition of each sample, making it easy to compare samples within and between each sampling effort. The information in the report provided by NatureMetrics is in many ways ideal for a site such as this, where we are not expecting the occurrence of any particularly rare or interesting species (which might require specialist search methods) but are more interested in any changes in species composition and abundance. The differences in the composition of samples collected between months is immediately apparent, with Diptera (flies) and Coleoptera (beetles) remaining the dominant taxa in both months but Heterobranchia (namely slugs) and Collembola (springtails) becoming much more abundant in September compared with June. It will be very interesting to see how our results compare in following years, with NatureMetrics results allowing us to easily detect changes in the invertebrate communities of the grassland margins of this wind farm. Check out this video John made. Here is some footage of bats emerging from a building, captured on our thermal imaging camera. It’s nearly Christmas which means it has been exactly a year since I became a member of the Wild Frontier Ecology team. Unfortunately it is also means that my time here is coming to an end. The year has flown by so quickly which I believe is testament to how enjoyable working for Wild Frontier has been. Taking biometric data of a brown long-eared bat caught during a mist netting session. I am grateful to all the team for giving me the opportunity to build on my skills and experiences within a friendly and supportive work environment, and what an opportunity it has been! I have been introduced to bird song ID, learnt how to handle adders, mist netted for bats, surveyed for water voles and badgers, learnt to identify plants and trees, completed a radio-tracking course, caught hundreds of newts and most importantly of all sifted through animal droppings (an essential skill for any self-respecting ecologist). 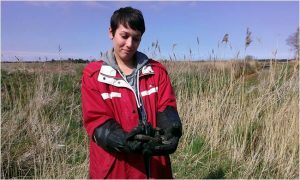 Of particular highlight was a crash-course in adder handling in the Norfolk Broads and handling my first bat during an after work mist netting session! The ecologists at Wild Frontier are experts in their respective fields and incredibly passionate about what they do which is evident in the quality of the training and advice I have received. Learning how to handle adders in the Norfolk Broads. As well as practical experience I have also developed my analytical and data handling skills, report writing, GIS skills, critical thinking, communication skills and table tennis! I have no doubt in my mind that the personal and professional development I have accrued during my time at Wild Frontier will help me progress through my career. Indeed I have been lucky enough to win a studentship at The University of Bristol and I believe that my success at the application and interview stage was due, in part, to the skills and confidence gained at Wild Frontier. I have many fond memories to take away with me when I leave Norfolk as well as a wealth of new knowledge and skills. I’d like to thank the team for their patience and encouragement and wish them all the best in the future. At Wild Frontier Ecology we are constantly looking to ensure that we move with the times and have all of the most up-to date technology and methods at our disposal. For me keeping up to speed with all the technology can be a challenge, as my first passion is for the wildlife not the kit. I certainly much prefer to be shown how the kit works rather than spending a day wading through the manual! One of the things that so far I have relatively little experience with is radio-tracking. 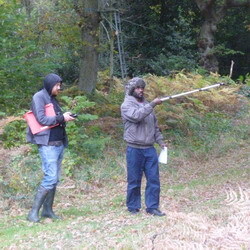 Fortunately WFE recently purchased plenty of radio–tracking kit, and we are very lucky to have expertise on the team. My colleague Dr Charlotte (Lotty) Packman has radio-tracked a variety of species over the years, and is perfectly placed to teach me how it works. With this lack of experience it would appear I was not alone. For many people this is not experience that is easy to come by as the kit can be expensive, and it’s certainly the kind of thing you want to have a grasp of before spending large sums of money on a key project. 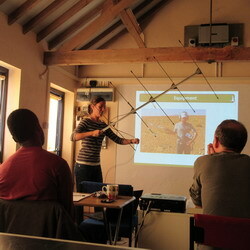 With an obvious gap in the market for this training we decided to run our first training course ‘Introduction to Radio-tracking’. With potential radio-tracking projects in the pipeline I joined the course to ensure that I could hit the ground running next season. 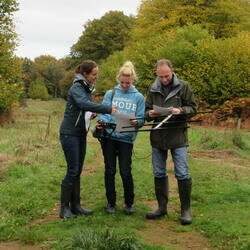 The course was based at our offices near Fakenham in Norfolk. The morning session was split into two office-based theory sessions. First there was an introductory presentation explaining the uses of radio-tracking from first principles. Lotty was able to draw on case studies from her own experience to show how radio-tracking can be a useful tool, and what the limitations can be. 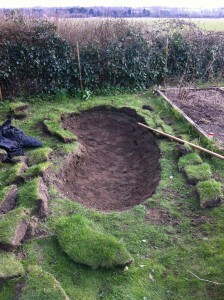 We discussed the problems of finding Hermann’s tortoises in France when dug into the ground or hiding in dense scrub. We looked at how Lotty had been able to map the home ranges of Bengal floricans in Cambodia, and assess the survival of reintroduced Houbara bustards in Uzbekistan. And of course we learned about radio-tracking bats, with Lotty explaining her recent and best known project, looking at the management of bats in churches. In this project, bats were tracked to find their exact location when roosting within a church, and across the countryside to identify alternative roost sites. The second morning session looked at planning and implementing radio-tracking projects. We discussed the different types of kit available, the different methods for attaching a transmitter to different animals, and the implications for the individual of attaching a transmitter and tracking them. Lotty had lots of useful advice on the best way to use the kit, and having been split into pairs we all got a chance to take a look at kit and learn the basics of operation before a break for lunch. Once lunch was over, it was a short drive to a nearby National Nature Reserve for a chance to have a go for real. We had a bit of practice getting a feel for the kit with a tag left out in the open; then we set off in out pairs for a “treasure hunt” for tags. My colleague Will had spent the morning hiding tags around the wood for us to find. Some were relatively large and could be spotted by eye once we got close. Other tags were of a type that could be used on bats. These were tiny, and very difficult to spot in the woodland setting, so using the kit to accurately pinpoint the location was a skill to be learned. My partner and I went round and round one spot desperately trying to fix on the tag’s location! Fortunately Lotty was close by to check how each of the pairs was getting on and offer further tips for each situation. As woodland is one of the hardest terrains to radio-track in, Lotty wasn’t making things easy for us. The trees can distort and bounce the signal from the tags, giving a sense of being closer to the tag than we thought. Nevertheless with practice using the triangulation technique we managed to locate all our tags. As the afternoon drew to a close a good-natured competition developed between the pairs as to who would find the last tag…! Following the success of our first course we will be looking at running it again in March next year so if anyone is interested please get in touch and check out our radio-tracking course page. In 2014 WFE conducted its first in-house training day. Each member of staff presented to everyone else a talk focusing on a relevant strength held by that person but which was less familiar to the rest. For example, Will gave a presentation on preparing CSH and BREEAM assessments, and Susie’s talk was on conducting a NVC survey. This was a very useful exercise for everyone and so it was repeated in 2015. This year was different in that Rob assigned a presentation topic to everyone which would be more unfamiliar and so would require some investigation. My charge was to provide a synopsis on the evidence base for the success of ecological enhancement techniques. Ecological enhancements, as they relate to consultant ecology work, are measures proposed to improve the ecological assets of a given site, but which are independent of the impact assessment, i.e. they are not mitigation or compensation. The purpose of any ecological enhancement proposal is to provide some biodiversity benefit above and beyond what is required to neutralise any anticipated negative effects from the development. Generally speaking, the scale of an enhancement proposal is in proportion with the extent of the development. For instance, the enhancement proposals for a small housing development might include plantings to fill the gaps in the site’s boundary hedges and the erection of a few bat boxes. On the other hand, the enhancement proposals for a multi-turbine wind farm are more likely to entail planting new hedgerows, creating new woodlands and restoring ponds. Enhancements may be proposed even for a development with no anticipated negative ecological impacts. This is because the National Planning Policy Framework and the Natural Environment and Rural Communities (NERC) Act 2006 place an obligation on all Local Planning Authorities (and other public bodies), in the discharging of their functions, to consider the conservation of biodiversity as a responsibility and an objective. Any new development which must secure planning permission could, as long as it is feasible and reasonable, be expected to make a contribution to conserving biodiversity. To summarise my findings in brief, the range of ecological enhancement schemes typically prescribed by WFE do have a reasonable likelihood of achieving the desired effect, but only if key principles are achieved. Firstly, the opportunities/limitations of any particular site have to be correctly ascertained; enhancements which have a low suitability to the context of the overall site or the specific location chosen are far more likely to fail. Secondly, all important variables have to be considered and stipulated in detail based on best practice advice and/or personal experience. Overly broad proposals are destined to be less successful; e.g. a statement to “Install ten bat boxes in woodland habitats” as opposed to a map of bat box locations selected by a licensed bat worker on-site, with designated bat box styles, heights and orientations, plus a recommended management schedule. This was a fruitful endeavour for me and for the rest of WFE, as we will look to apply the findings of this research to improve our future ecological enhancement proposals. So who gets my green vote? I like to plan ahead. I have been thinking ahead to next year, in particular to the General Election. In a scenario where I could put all other pressing issues aside, and just vote for the political party based on their green policies and credentials, who would I vote for? And what exactly are “green” issues? Personally, the issues I really care about and which I believe affect me directly are, in no particular order, planning and infrastructure, flood management and water resources, nature conservation, climate change and renewable energy. I was looking out for these issues. So, I thought a good place to start might be to look on each of the main parties’ websites to see what was on offer in the way of one-line promises. As I live in England, my definition of main parties was Labour, Lib Dem, Conservative, UKIP, and Green party. Labour: There’s no page dedicated to the Environment on the Labour website, so I searched the website and came up with a speech from August this year at WWF UK by Angela Eagle, the Shadow Environment Secretary. 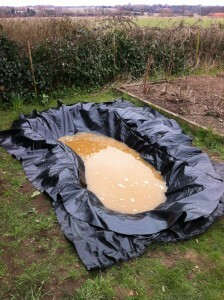 “Labour will take flood protection seriously. We will re-prioritise flooding as a core responsibility of Defra. We will end this Government’s short-term approach to flood investment and prioritise preventative spending that can save money in the long-term. As part of the Armitt Review, we will establish an Independent National Infrastructure Commission to identify the UK’s long-term infrastructure needs, which will include flood protection.” And then there’s some stuff about air pollution. No mention whatsoever of nature conservation or climate change, a bit remiss considering the venue! My assumption here is that these issues are “very low” on the Labour agenda. Conservatives: there is no mention of the environment at all on the party website (or, indeed, any of my other pet issues). The nearest I could come up with was “Investing in better infrastructure, including roads, rail and broadband – so it’s easier to reach customers”. A very poor website all round in my opinion. And clearly environmental issues are not important at all. Apart from a tree symbol painted the colours of a Union Jack. Lib Dems: At least their website has an environment page, so they score points. Lib Dems claim to have created 200,000 new jobs by investing in green energy (yes folks, that was all the Lib Dems’ doing). They have also planted 1 million trees in a government tree planting scheme, and (looking forwards at last) promise to put a 5p charge on plastic bags. UKIP: The two vaguely environmental policies are: Scrap HS2, all green taxes and wind turbine subsidies. Develop shale gas to reduce energy bills and free us from dependence on foreign oil and gas – place the tax revenues into a British Sovereign Wealth Fund. Well, I don’t agree with the policies, but at least they have a couple they can put their name to. Tackle climate change faster and more effectively by moving Europe from a fossil fuelled economy to one powered by renewable energy. We need to leave fossil fuels in the ground. Prepare for increasing impacts on ourselves and our neighbours by investing in upland water conservation and flood defences, to shield us from extreme weather events. Protect our natural world from short-term corporate interests who invest in its destruction. End factory farming and animal testing, crack down on the illegal trade in wildlife, and introduce strong animal protection standards. Cut demand by encouraging European incentives for home insulation, reducing the amount of energy we need to heat and power Britain’s homes, and providing much-needed jobs. Change the types of energy we use by speeding up the transition from fossil fuels to renewable energy by voting for increased targets in Europe. Reject harmful long-term solutions. We would ban all fracking and stop building nuclear power stations. Bring the railways back into public ownership and build new local lines and trams. Restore local government control over buses to improve provision and give them preferential road space. Work to reduce petrol and diesel use. Scrap the pointless and hugely expensive HS2 – a train line for the 1%, not the 99% of rail users. Well, the Green party, as I might have expected, do tick a few of my boxes, and have at least considered some of the issues. Overall though, it is clear that the issues I have identified as being important to me as a voter (and arguably of critical importance to the country as a whole) are not prominent on the mainstream political agenda. Do I therefore have to add my voice to the many who say that our political elite is out of touch with the voters? For the election, of course we have to wait for the publication of the parties’ manifestoes. I will be very interested to see how the parties compare, and yes, it will affect the way I vote! 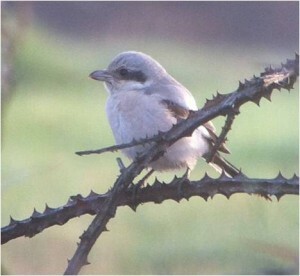 The steppe grey shrike which appeared recently on the North Norfolk Coast at Burnham Norton brought some controversy during its stay. The bird was, at times, confiding, and was very popular with photographers. Photos of the bird are shown on social media with a mealworm in its beak, and even (apparently) with a dead vole, although I haven’t been able to track down the latter. These were food items placed by photographers to entice the bird closer to their lenses. I went to see the bird myself, and indeed I took a few photos, though from quite a distance through my telescope using my phone. There were several photographers there at the time, the bird posing nicely and coming to the ground to pick up mealworms within a few metres of the camera scrum. Each time the bird approached there was a round of ferocious mechanical clicking, sounding perhaps a bit like tiny machine guns. I can’t imagine how many thousands of photos were taken of this bird, a proportion of which made it on to the internet, and a few of which show the bird with mealworms. There were certainly more than enough. Anyway, what interested me was the use of bait to draw the bird closer. My initial reaction to this was that it was wrong in some way. And I still feel it is, but why? Clearly, if the bird were protected in some way, and there was a question of interference with its nesting site, or it required a licence to photograph, the case is black and white, and photography, let alone baiting, would not be allowed. But this bird was a migrant, and there was no legal issue. Furthermore, the bird willingly came down to feed on the bait, and arguably may have benefited from the food source as it was very considerably lost. What, then, was the difference between providing bait for this bird and feeding birds in your garden? I had to admit, on the face of it, not an awful lot. And wasn’t it better to feed the bird to get good views of it rather than flushing it out of a bush, as has happened with some rare birds? But wait a minute. There’s something else here. One of the attractions of bird migration to me is the feeling that we are able to make a connection with something wild and free, which knows no boundaries and is to some extent free from human influence. This bird normally spends its time migrating between the steppe of central Asia and the Indian subcontinent, and yet (miraculously) has turned up in north Norfolk. It seems to me the essence of its wildness seems somehow to have been compromised by the baiting. Also, the baiting of a bird for the purposes of photography (when hundreds of good photos have already been taken) is essentially a selfish act by the baiter, with little regard for the enjoyment of others coming to see the bird. There was a feeling that the extraordinary had been made simply ordinary, and had become a toy of the photographers. Do not entice a wild animal with food (baiting) in order to get the photo. Allow the animal to be wild, and to move about on its own accord. Note – photos of live-baited birds are prohibited in the NPN Avian Gallery. Photos of baited wildlife are prohibited in the NPN Wildlife Gallery. An image will be rejected if in the opinion of the judges it appears that the image has been taken in such a way that wildlife law or animal welfare requirements may have been breached; protected species or habitats have been compromised; or the image has been otherwise taken in an irresponsible way. If you are licenced to take pictures or visit areas which might otherwise be unlawful you should say so, and we may ask to see the licence if your picture is shortlisted. Photographs using model animals or live bait are not permitted. There are few other codes of conduct for wildlife photography to refer to (on my brief internet search anyway), and with the rise in digital technology and the sheer number of photographers that are around now, surely it’s time for a more prominent and definitive code of conduct. That is not to say that the baiting of the Burnham Norton shrike was right or wrong – but what do you think? Steppe Grey Shrike – Not shy. 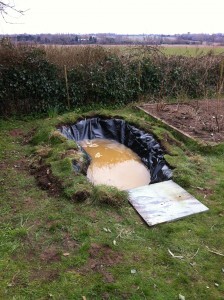 Last year I made a wildlife pond in my garden, and I thought it would be interesting to share some of my experiences. I started the mini-project in late March. A little bit shady in the morning, but in full sun in the afternoon and evening. 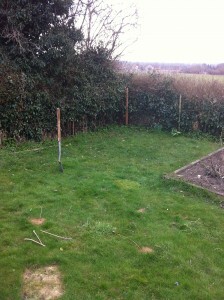 The area was reasonable flat, and did not interfere with our football pitch! After a few days, the water started to settle and my daughter and I introduced a couple of branches so that birds could bathe and insects could perch close to the water. I added some plants, all of which were borrowed from friends’ ponds; these included broad –leaved pondweed, rigid hornwort, brooklime, gipsywort, water soldier, frogbit, water forget-me-not, common spike rush, lesser water parsnip and water plantain. 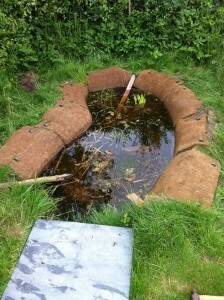 Adding the plants instantly cleaned the water, and also accidentally introduced some invertebrate life including pond snails. And there was abundant life – frogs and toads, smooth newts, water beetles (3spp), water boatmen, pond skaters, numerous aquatic larvae, at least 3 species of water snail, azure damselfly, ruddy darter and common darter. 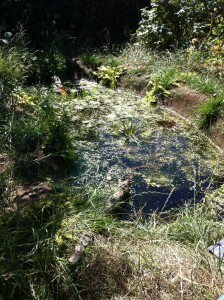 Flies and wasps visited the pond edges, and duckweeds grew in abundance. The only real maintenance I have done so far is to hoik out some duckweed every now and then, and to reduce the hornwort likewise – just to retain some open water areas. And the kids absolutely love it! If there is a quiet time of year for Wild Frontier Ecology then it is the winter time, so we thought we would take a day to go out as a team to gain an interesting new experience. But what to do? Well for ecologists many of whom have been stuck in the office the only option is surely to get outside and do some conservation work. I have been volunteering at Buxton Heath just north of Norwich on and off for nine years now, and have some good connections there, so that’s where we went. Buxton Heath is the most fantastic place. It is a site of European importance managed by Norfolk Wildlife Trust -a complex of habitats including valley mire, wet heath and dry heath. The mire is a botanists dream, the buzz species has always been marsh gentian but for impact you just can’t beat the mass of orchids, and my personal favourites beautiful bog bean and round leaved sundew. In the summer adders are also to be found all over the site, and I have regularly seen butterfly enthusiasts cooing over the silver studded blues up in the dry heath. An evening trip can also be rewarding with nightjar and glow worms. Buxton Heath is also a great place to see turtle doves. Rob is about to embark on Dove Step, a 300 mile walk to raise money for this species, find out more on the Dove Step site. This time of year there is less to spot but there is always something to see. We were rewarded by three snipe shooting out in front of us and the Sphagnum looks great this time of year for those who can be encouraged to look at the smaller things. 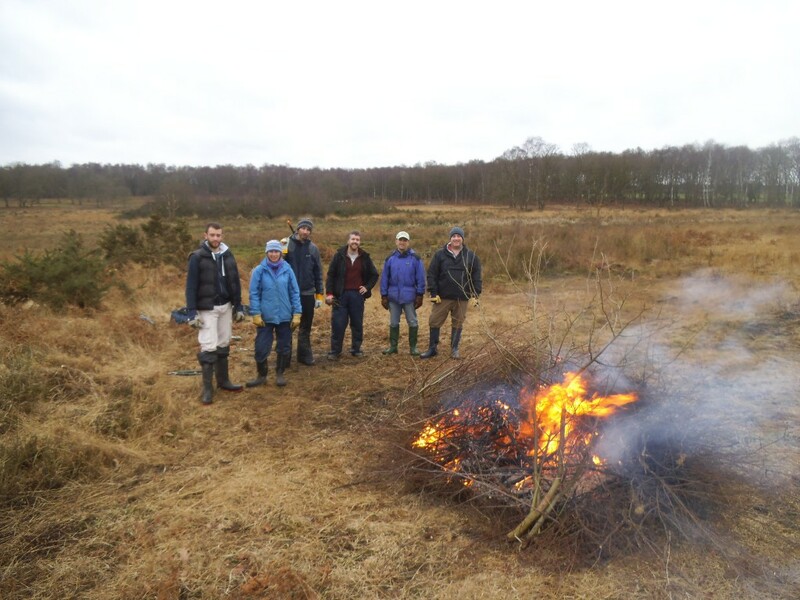 This is also the time of year for practical conservation work at the site to take place, to maintain top habitat for all the specialist species. We were met at the site by voluntary warden Phil Davison. He was only too willing to point us in direction of some young birch that needed removing, just north of the mire. So armed with loppers and bow saws we set to. Phil poisoned the cut stumps to try and prevent further re-growth, and then we could drag the cut saplings away. Phil is in charge of the Buxton Heath Wildlife Group which has undertaken some of the management of the site for many years. Hand cutting of scrub is very important both within and on the edges of the mire habitats, where larger machinery just can’t get! Without a bit of hard work, willow and birch would soon colonise this site and many important habitats would be smothered. Rob can make fire out of anything. Having created a huge pile of birch I then attempted to get the fire going. Let’s just say this isn’t my strong point, damp paper and the wind wasn’t helping. Many good matches were wasted as the wind put them straight out. Fortunately for us Rob is the fire master (who knew?). 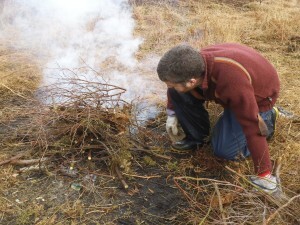 After a few false starts we soon had a roaring blaze to dispose of the birch and to keep us warm. 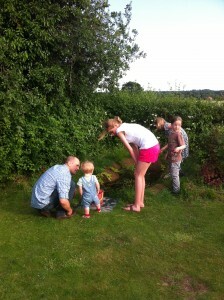 After a busy morning of cutting and burning (and a filling pub lunch) we finally had a walk round the site. Although the morning had been a fine one the rain soon came in. It soon became a fairly brisk walk back to the cars. We might be damp and smelling of smoke, but I certainly felt exceedingly happy after a rewarding day. Thousand species challenge – the results are in! My thousand species challenge finished on New Year’s Eve, yet it felt more like a beginning than an end. This was an epic undertaking, but with the most amazing educational and obsessive attractants. The target was to find one thousand species, of any taxa, within a single kilometre square. 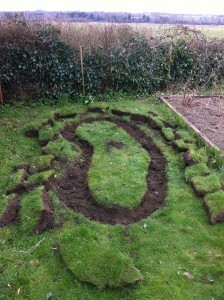 The square that I chose included my garden, which also provided an interesting journey of discovery. The moth trap was a major source of new species, and gave me valuable new skills, but it was the other taxa that really tested me (apart from birds). I never knew how difficult fungi were to identify, or caddisflies, or bees. Conversely, I found spiders, ground beetles, molluscs and hoverflies more straightforward. 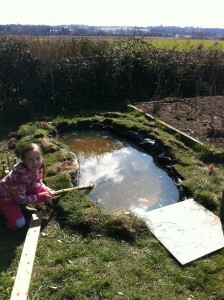 It was also interesting to learn something about the habitats within my 1km square. A green lane was amazingly diverse, and the ponds, ditches and streams were an obvious source of new species. The garden was also terrific. These are important lessons for ecologists I think. Even small and isolated patches of habitats within a less diverse landscape are important for biodiversity, and not just protected species. Perhaps 3 out of the 1170 species I noted were legally protected! It’s also the start of a great journey for me, as I start to become more knowledgeable about some species groups, and maybe even start finding some really rare and interesting things! It’s known as pan-species listing. Look it up, it may be for you! 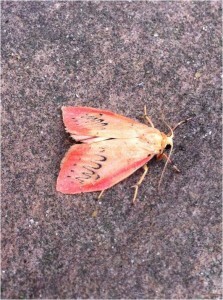 Rosy footman moth, one of the 1170!